A 3D Pokémon battle game. Select a team of six Pokémon, or upload them from your Game Boy games, selecting three to take into each battle against trainers and Gym Leaders as you strive to become the Pokémon Stadium Champion. 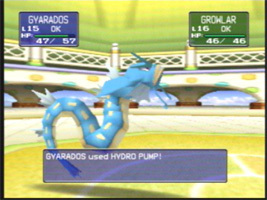 Some Stadium Cups only allow you to take certain Pokémon into battle, such as unevolved Pokémon or Pokémon under a certain level. Play multiplayer battles against friends in the Stadium, take part in a selection of minigames, and play your Pokémon games on the big screen at the Game Boy Tower.